O.K. I lied! 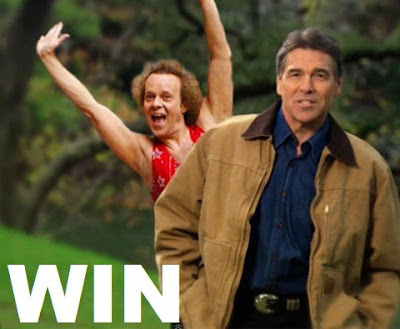 In the last post about this Rick Perry "Strong" Ad I said it would be my final...but then I saw this. I love all the Bad Lip Reading videos and I just had to post this one. Here is a little background on the Bad Lip Reading creator, who wishes to remain anonymous. So who is this guy? He's a successful "late-20s-ish" music and video producer from Texas — "It's a one-man show; it's just me" — whose introduction to lip reading was personal. BLR's mother, herself a musician, went profoundly deaf in her 40's: "She went from having perfect hearing to having no hearing in just a matter of months, and the doctors never figured out why." BLR marveled at the way his mom, of necessity, became an expert lip reader. He would sometimes sit around at night, watching TV with the sound off trying to pick up the skill himself. "I was terrible at it." But BLR's liability proved its comedic worth after he got a gig filming a pair of radio hosts, one of whom had the strange habit of silently mouthing words to himself as his partner yammered on. "The guys I was shooting with, we kept looking at each other: 'What’s he doing, what’s he saying?'" As a joke, BLR took the footage back to his studio and tried to decipher the whispered words. "Just bizarre, random phrases started coming up — things like 'bacon Hobbit.' Those were probably the funniest videos I ever did — but they were just for my friends."